Lightweight and low profile design allows for storage in closets or tight spaces. Each step is serrated and has a spring loaded locking pin that automatically engages to secure step height. The release mechanism provides a smooth automatic closing design. 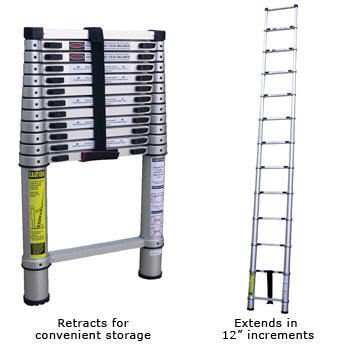 These ladders extend in 12" increments. Top bumper guards and molded rubber feet protect walls and floors against scratches. 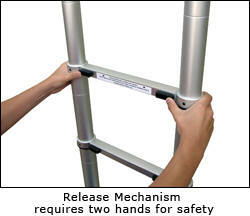 Meets OSHA and ANSI specifications. FOB Shipping Point. W x D x H Step Depth Cap. (lbs.) Wt. (lbs.) Price Ea.